Google’s algorithm is a mystery, and that’s why there are so many conspiracy theories and so much paranoia around it. But how can you tell reality from myth? Gianluca Fiorelli presented his slides to help us distinguish truth from lies. 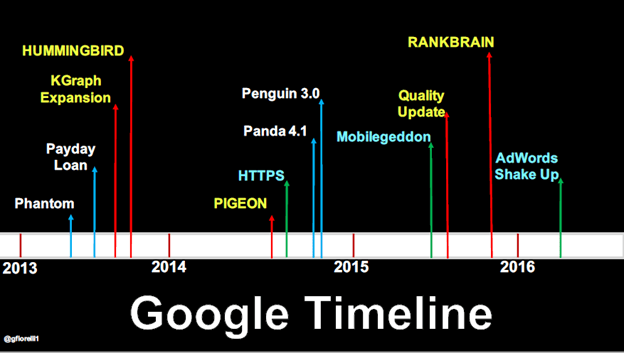 In the following picture you can see Google’s algorithmic timeline: each mark depicts a time when Google released a new algorithm. 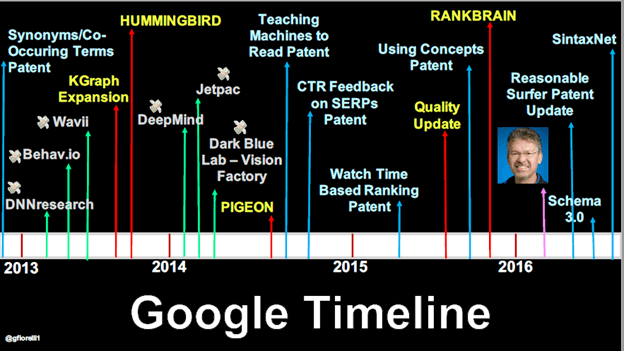 You can see that between 2014 and the present time — 2016 — Google bought many companies connected with machine learning and deep learning. Machine learning is used to understand content; however, the meaning of a piece of content cannot be completely understood without looking at the context and the signals that are sent by users. Searching — the phase in which Panda and Penguin algorithms take the stage. It is also the phase where 200 ranking factors matter. We should not limit ourselves to the Search phase only, as we often do. It is essential to take the most out of the first three phases as well, if we want to achieve maximum visibility from Google. Crawling is a domain ruled by technical SEOs, and in his presentation Gianluca focused more on the following two phases: parsing and indexing. Parsing is a very difficult process, because human language is extremely ambiguous. Even in moderate-length sentences, it is possible to have thousands of possible syntactic structures. So, the semantics of such syntactically similar sentences can be completely different. That is why it is so important for Google to be able to cope with natural language semantics. Semantics can be logical and lexical. Firstly, let’s talk about logical semantics. Schema.org was developed to help search engines identify the semantics of phrases and whole sentences. Speaking of structured data, one of the most important properties of Schema is its sameAs property which helps Google understand what your content is about. SameAs property helps Google distinguish the specific semantic meaning of an entity from other meanings it could have. So, Schema helps you annotate and organize your content so that Google can understand what you are talking about. Also, it is important to use semantics that are provided by HTML — HTML5 to be precise. It has elements that allow you to emphasize headers, lists, etc. HTML5 is becoming even more important and providing even more opportunities with relatively new Google’s feature Google Answers Box. If you provide relevant and well-organized information that users are searching for, Google will display your content in the top position above other search results. So, you should optimize your content for Google Answers Box to ensure that it remains highly visibility. What about the other type of semantics — lexical semantics? For digital marketers, lexical semantics takes the form of keyword and topic research. There are a number of tools that allow you to do lexical semantic research, for example, SEO PowerSuite. Moz recently launched Keyword Explorer tool as well. Also, you can use Google Suggest. In addition to Google Suggest, you can use Amazon, which has a wonderfully developed Search Suggestions section. Lastly, you can always use social networks' suggest features, for example Pinterest has a Recommended Board feature. 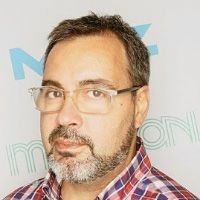 MOZ Associate, SEO consultant and Web Strategist, specialized in Inbound Marketing and International SEO. He started working in the Web Marketing Industry in 2004 and since then he offered his services as an independent consultant.